Your baby is growing like a weed! So well in fact, you can probably feel baby more often and better. It’s a wonderful feeling. Place your hand on your belly when you feel baby move and take a moment to enjoy the miracle growing inside of you.You can also start playing with your belly baby now! Your baby now weighs 15.17 ounces and is 10.94 inches long. Start looking for the things you will need for the nursey and at prams. These often have long delivery times and by orienting yourself now, you will everything in the house on time. You can of course look for second-hand nursery furniture. Then you could also do the items up and turn them into your own creations. If in the first weeks you couldn’t wait until your belly was showing, you may now be wondering if it will ever stop?! 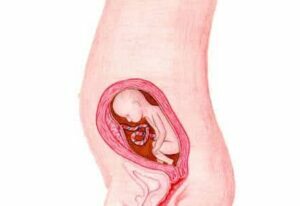 Once you have passed twenty weeks, your belly continues growing gradually. Dieting to lose weight during pregnancy is a no-no, but neither is there any need to eat for two. During your pregnancy you will gain an average of 26 pounds. Continue eating healthily, have responsible snacks and try to keep moving.